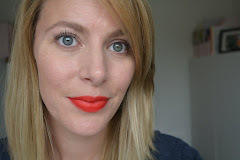 Today I’m reviewing the Revlon Just Bitten Kissable in Rendezvous. This particular product from Revlon is a lip balm come lipstain all wrapped up in this one chunky pencil. Revlon says - Revlon Just Bitten Kissable Balm Stain is a pampering balm fused with a lightweight lipstain in an adorable chubby crayon. Revlon Just Bitten Kissable Balm Stain softer, smoother lips with a perfect flush of color that lasts hour after hour. The gel formula comes in 12 vibrant shades that match any look or mood. I’ve been testing this out over the last week and here are my thoughts on the Revlon Just Bitten Kissable in Rendezvous. This product has a light mint fragrance to it which so upon application I felt a lip tingly sensation. Rendezvous came out the exactly the same colour as the actual balm stick, which is a nice coral orange stain. The nice thing with this stain I found is you can also build the colour up for a more intense look. It applied very easily and felt incredibly moisturizing. Over the course of the day though I found my lips felt very dry, when I checked my lips the colour had sunk into the dry skin, which obviously doesn’t look nice. This certainly did stain the colour onto my lips and once I had reapplied the RJBK my lips looked a lot better again. I would say its just one thing to bare in mind when purchasing this product. Have you tried the Revlon Just Bitten Kissable's? I'd love to know if anyone else has had the same experience as me.